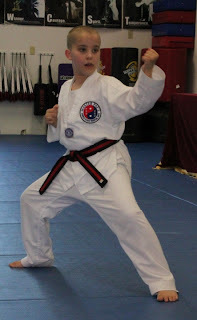 Sam started tae kwon do just before his sixth birthday. At the time, we didn't know how much he would come to love the art. Before we knew it, we were investing putting in quite a bit of time and money into tae kwon do. For a while, he attended class ten hours a week...and complained that we wouldn't let him do more. He participated in a few tournaments over the past three and a half years, bringing home medals at each. The last tournament, he brought home gold in sparring and bronze in poomse. He's got a good collection of medals despite the fact that we limit him to no more than two per year. He also begged to learn Korean, which he started through Rosetta Stone this past school year. A year ago, we switched schools. He's learned so much from his new master. They do things differently there, and he had to catch up by learning all of the forms required for each belt level at the new dojang. He started sparring class for the first time, and has improved in that area a ton. Finally, the big day arrived. Last Friday, Sam endured two hours of testing. After some warm up and a brief talk from the master, he started. They looked at punching techniques, kicking techniques, sparring techniques, knife defenses, and poomse (forms). For the black belts, they required two essays which had to be read aloud in front of everyone in attendances. They also required that he name at least 15 Korean words (from a given list) and their translation and one long phrases. Sam nailed the language part, and spilled out 24 words and phrases. The master joked about giving him Korean citizenship. Then about 14 hours later, it was time for part two of the testing...and the school picnic at a park. Sam had to test in sparring, three-on-one sparring, and breaking. He did great. Sam passed with an outstanding! We're really proud of Sam. It's been tough at times, but if there's one thing that Sam has, it's persistence. What a joy it has been to watch Sam excel at this. I love the enthusiasm he has for this and so many other things. Congratulations Sam! You're an amazing kid!